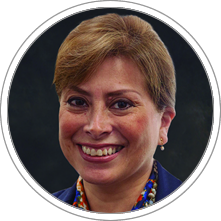 Professor Sylvia Santisteban holds a Master in Business Administration from University of the West of England Bristol, United Kingdom, and an undergraduate degree in Economics from Universidad del Pacífico, Peru. She has carried out studies in Strategic Management, Human Resources Management, Change Management and International Negotiations Skills at the Institut Commercial de Nancy, France and at the Georg-Simon-Ohm Fachhochschule in Nuremberg, Germany. Professor Sylvia Santisteban has worked as a Business Development and Investment Manager at the Australian Trade Commission (Austrade), Director of Marketing and Sales for the Americas at VA TECH ELIN USA Corporation in Pittsburgh, USA, and Marketing consultant in the railway technology sector at ELIN EBG Traction GmbH in Vienna, Austria. She has been senior business executive for corporate services at Banco de Crédito del Peru and other financial institutions in Peru. Professor Sylvia Santisteban is currently founding partner and General Manager of Sawa, a company dedicated to consulting and training in processes of change and organizational culture and Professor of the Academic Area of Strategy, Leadership and Management at CENTRUM Catholic Graduate Business School. Award for part-time faculty academic excellence in Masters Programs 2011. Award for part-time faculty academic excellence in Masters Programs 2013. Award for part-time faculty academic excellence in Masters Programs 2014. Award for part-time faculty academic excellence in Executive Education Programs 2014. Award for part-time faculty academic excellence in Executive Education Programs 2015.